Chad Bettis is on the Rockies. You might be inclined to move on after the very first sentence of this post, but let me convince you otherwise. Chad Bettis finished 2015 with a 4.23 ERA and 1.41 WHIP. However, on July 7th, he was shellacked in Colorado by the Angels. Excluding this 2.1 IP start, he would have ended the year with a 3.50 ERA and 1.33 WHIP. That has utility in most, especially deep leagues. I personally just drafted him in the 47th round of my only NFBC Draft Champions League thanks to his Arsenal Score, which is sandwiched between Dallas Keuchel and Max Scherzer. Don’t get worked up. Bettis should not be in the same sentence – or matrix – as Keuchel and Scherzer. The matrix should be updated next week with pitch usage weights (increasing the Fastball value due to usage approximately three-fold to approximate MLB rates). This will drop Bettis in the rankings significantly. If we look at his 2015 sabermetric outcomes on his Brooks Baseball Player card, we can see that his Fastball whiff-per-swing rate is -0.74 standard deviations worse than the average fastball. Rotochamp and Steamer grounds our expectations. If you adhere to their projections/these rankings, you might not land Severino, Ross or Nola. ADP on the other hand will make you reach at times. Eno provided a KPU-BB leaderboard (K% + Pop-up% – BB%) this past Tuesday. Here is another approach to ranking starters in addition to our Pitch Repertoire Scores. If you don’t have an issue with position scarcity adjustments, then I already furnished 2016 Fantasy Baseball Rankings with Steamer Projections and highlighted sleepers last week. Naturally, position scarcity remains an argument, but there is one solid way around the argument: find the best value (projections relative to average draft position) within the scarcer positions and prebuild a roster with options heading into the draft; then you can focus on best available value and not position scarcity. I will explain and provide options below. Last week, Paul Sporer reviewed NFBC average draft position (ADP) data. The week prior, I posted 2016 Fantasy Baseball Rankings using Steamer Projections and the FVARz approach to valuation. It’s Holiday time. Here is my Holiday present to you: 2016 Fantasy Baseball Rankings and $ Values using Steamer Projections and NFBC’s Format: (2)c,1b,2b,3b,ss,ci,mi,(5)of,u,(9)p and (17)bench spots. There is still a smorgasbord of outfield and middle-infield waiver wire options. Let’s sort using 20% ownership in Yahoo leagues as our qualifier. Last week, Jeff Sullivan presented Ryan Zimmerman’s Miguel Cabrera-esque success against inside pitches. 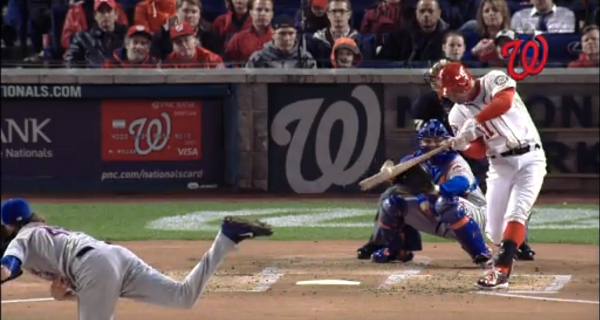 Ryan Zimmerman doesn’t mind fastballs in general. According to his Brooks Player Card, he is a career .295 and .310 hitter against Fourseams and Sinkers/Two-seamers respectively. BABIP, .ISO, HR/FB+LD, Whiff/Swings — any way you look at it — Ryan Zimmerman is at his best versus fastballs. Strikeouts are up. Offense is down. The MLB ERA as it stands is 3.39! You can read why in the The Hardball Time’s Baseball Annual 2015: Jeff Sullivan looks at whether or not sabermetrics have tipped the balance of power toward pitching and defense — it has. PITCHf/x evaluation is one major reason. More and more, pitchers know what works within their own repertoires, and we can then tell some “reperstories” based on their pitch characteristics (movement and velocity) and outcomes (swinging-strike and groundball induction). It has begun! May your leagues bring you much joy. What follows is one approach to auctions that should bring you future joy. I participated in two auction drafts. In both, I decided to spend little on pitching. In The Fake Baseball’s Friends and Family League (TFBFFL), I spent almost the minimum on our (co-own the free team with Zach Sanders) rotation and bench. I spent $16.00 on 12 pitchers ($2 max), but the results were not horrible: Drew Hutchison, Homer Bailey, Carlos Martinez, Henderson Alvarez, Shelby Miller, John Lackey, Sean Doolittle, Carlos Rodon and Rafael Montero. I dropped Chad Qualls already for Zach McAllister. We have enough bats to upgrade.